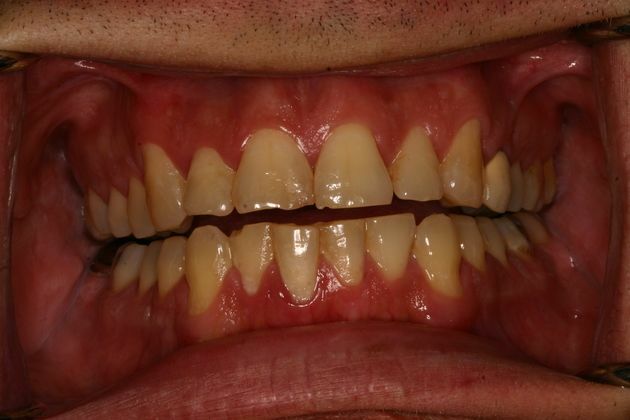 Full Mouth Restoration – Dentures? 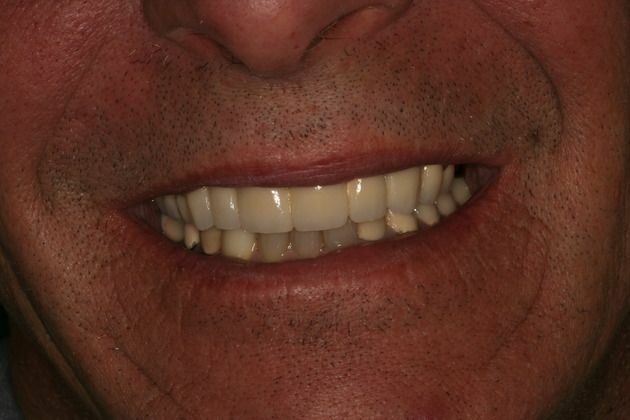 This 66 year old male came in with missing upper and lower teeth. He thought he would have to wear dentures. 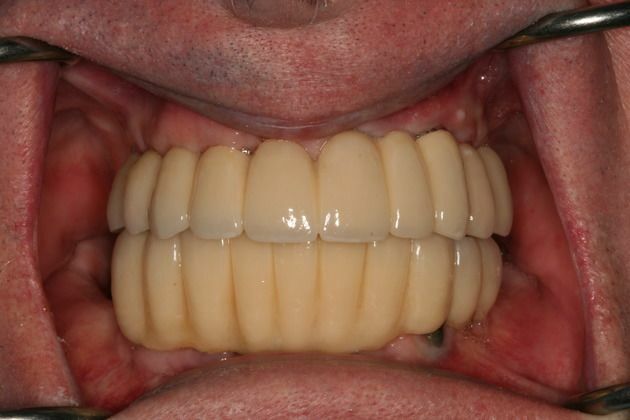 After thorough examination, Dr. Carnazza was able to design fixed porcelain bridges for both the upper and lower arches. All upper teeth and the two lower teeth were removed. 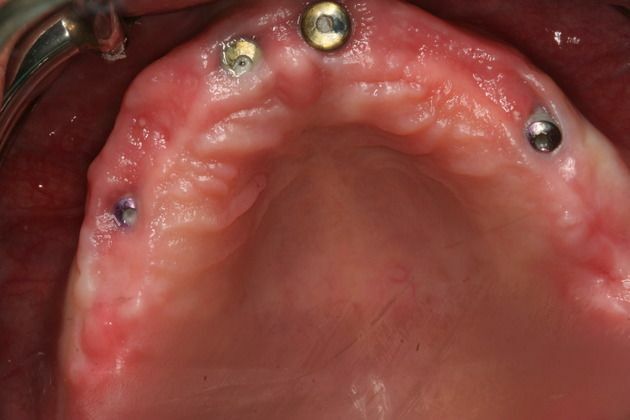 Four implants were placed on the lower arch and six implants on the upper. He can now eat and smile like never before. 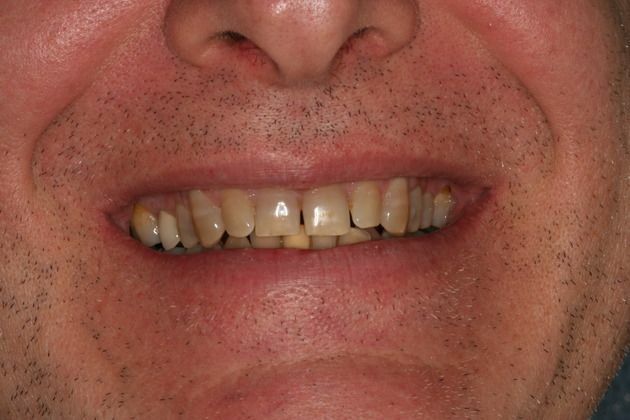 This 51 year old male patient wanted to enhance his smile and restore his old dentistry. 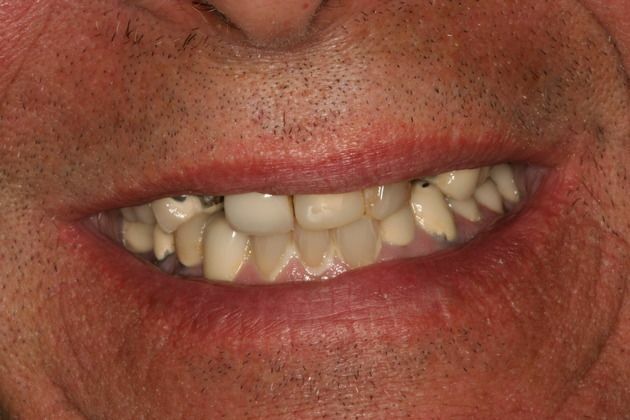 With the knowledge and training in advanced full mouth therapy, Dr. Carnazza was able to rejuvenate his smile and turn the clock back 20 years. He can’t stop smiling now. 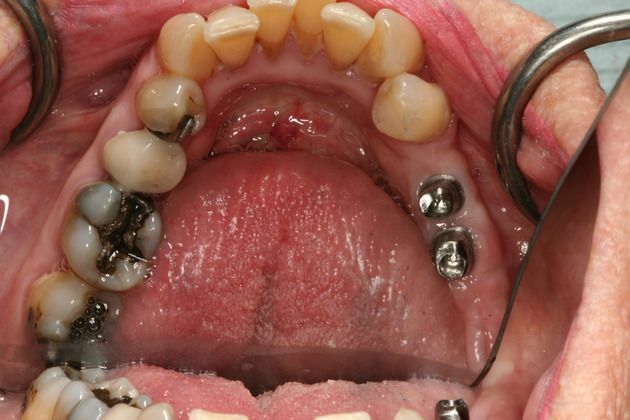 This patient had missing and broken teeth with failing bridgework. 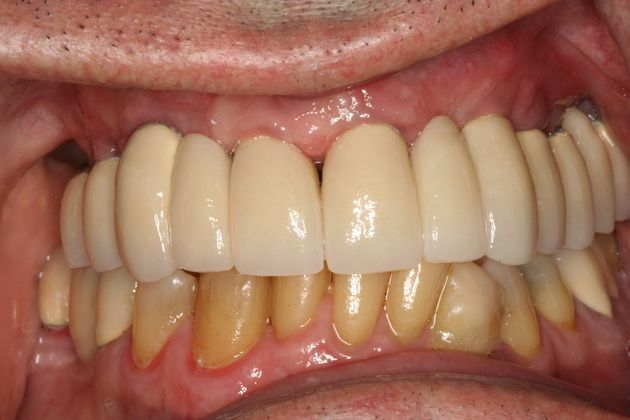 He was brought back to dental health with the removal of some teeth, and we were able to place a fixed full upper porcelain bridge. 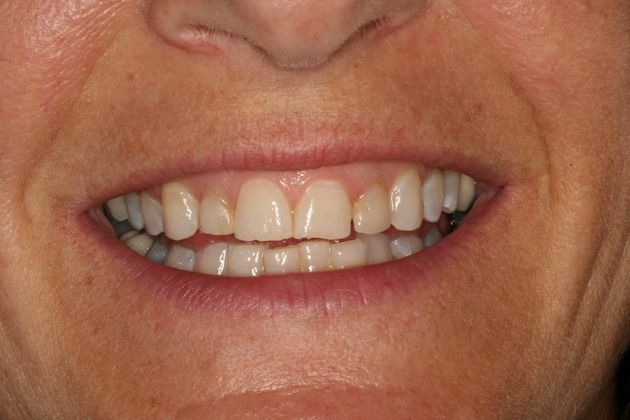 The patient can now enjoy a functional and beautiful smile. 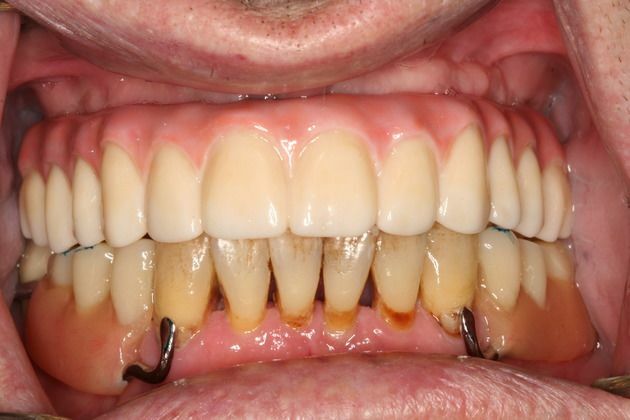 This 68 year old male presented with extreme wear and chipping of his enamel due to a poor bite and missing teeth. 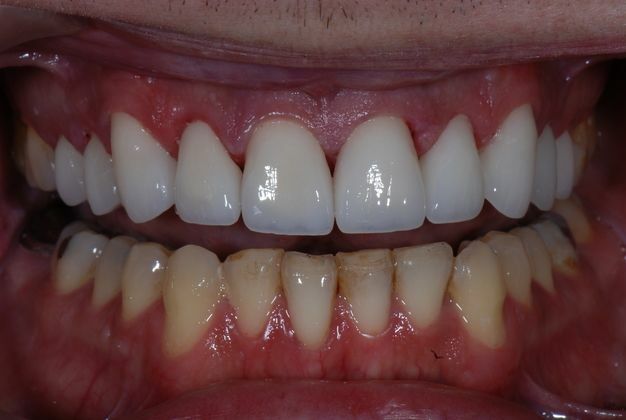 Dr. Carnazza was able to restore his teeth to their natural state and function with all ceramic and porcelain to gold bridgework. His confidence has been restored, and he can’t stop smiling. 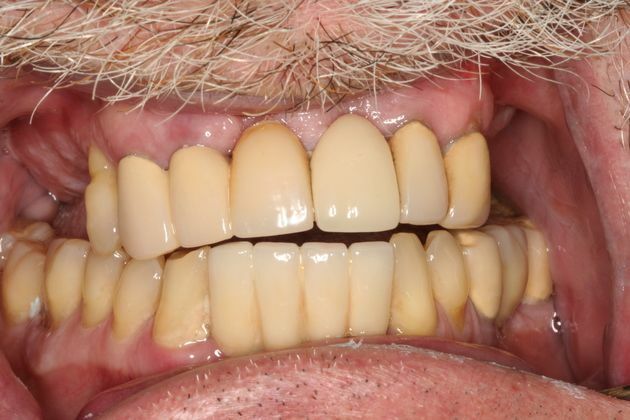 This 66 year old male thought dentures were his only option to restore his lower teeth. After thorough examination and cat scan imaging, Dr.Carnazza was able to place four implants to support a porcelain fixed bridge. He is now able to enjoy a quality of life like never before. 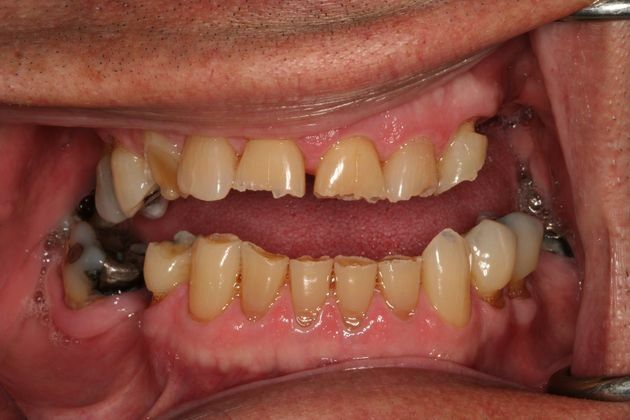 This patient is a diabetic and, as a result, lost multiple teeth and was not able to wear a removable appliance. 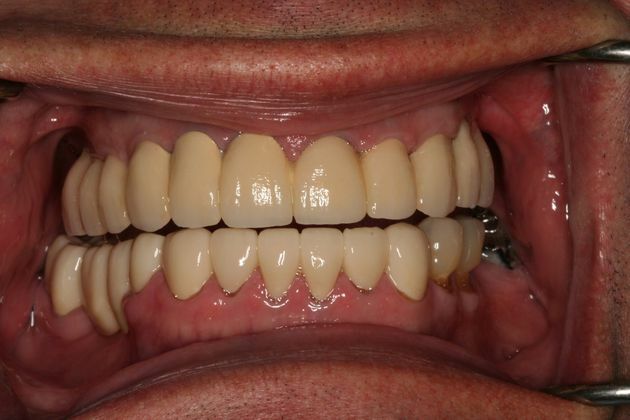 We restored him to dental health with multiple implants and fixed bridgework. 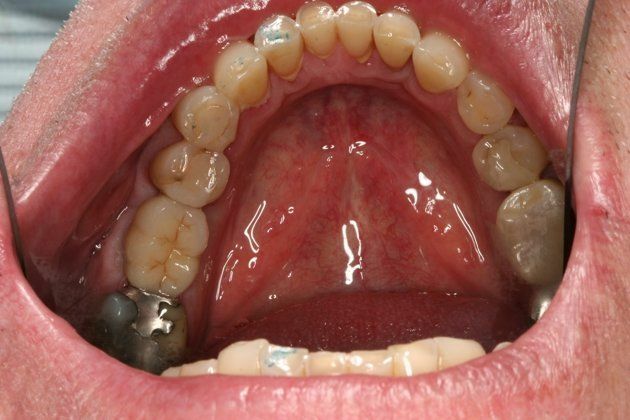 This 54 year old female patient had been missing her lower left bicuspid for many years. With the advanced science and education in surgical and prosthetic implant dentistry, Dr. Carnazza was able to replace her tooth and allow her to eat without discomfort in this area. 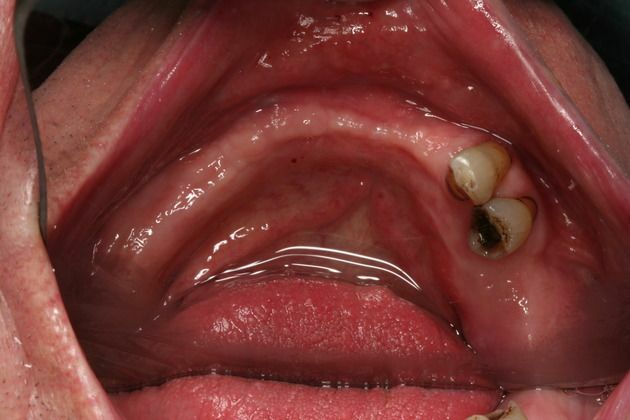 This 58 year old male presented with a failing root canal and abscess formation. 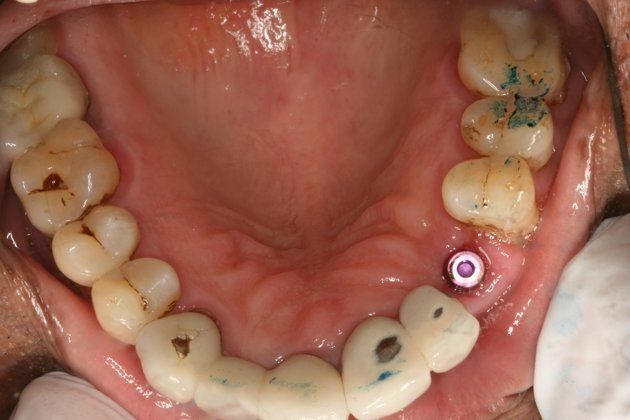 The best option was to extract the tooth and place an implant. 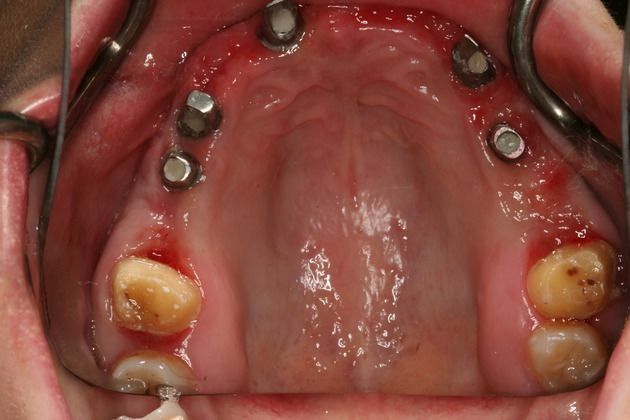 This 61 year old male patient fractured his lower first molar. With the advanced technique of bone grafting to maintain the extraction socket, we were able to place an implant and get him back into function right away. 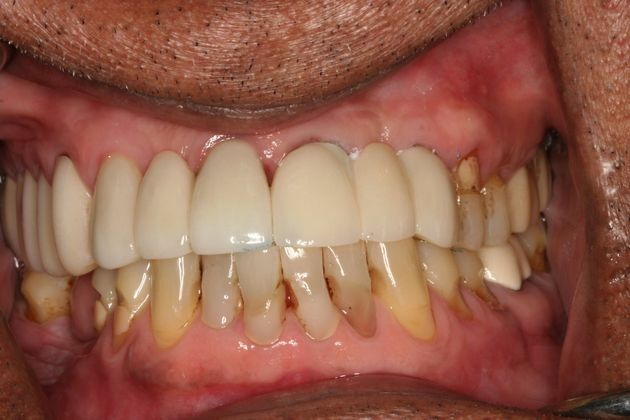 This 63 year old male presented with a loose left central incisor. 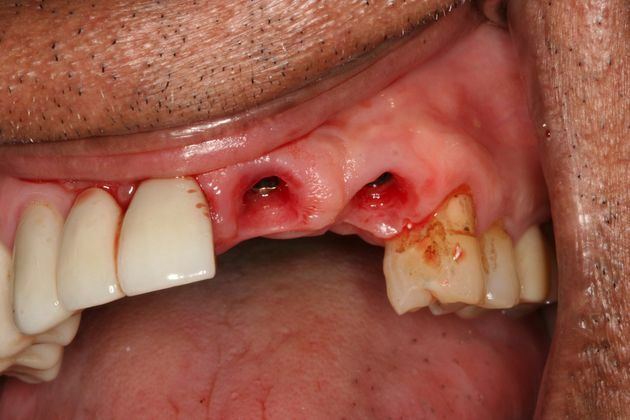 Dr. Carnazza was able to safely extract his tooth and immediately place an implant into the extracted tooth socket and load it with a temporary tooth at the same time. 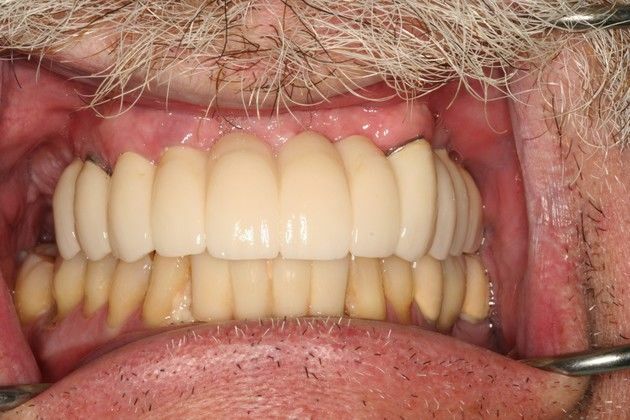 This concept is called “immediate placement and immediate load.” This way our patient didn’t have to be without his front tooth or have to wear a removable appliance while the implant was bonding to the bone. 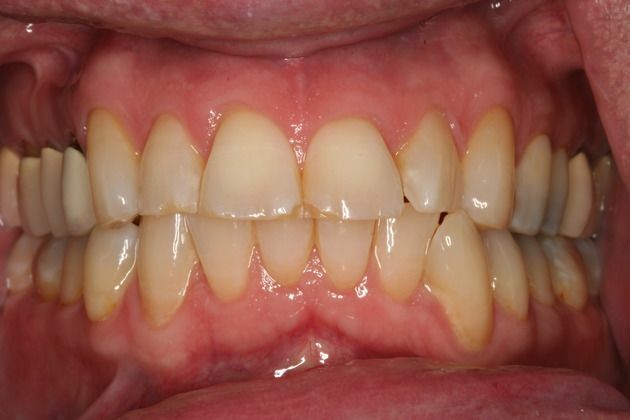 After 4 months of healing an all ceramic Zirlux bridge was placed. This woman was very unhappy with her upper removable appliance. She could not eat properly and was unhappy smiling. 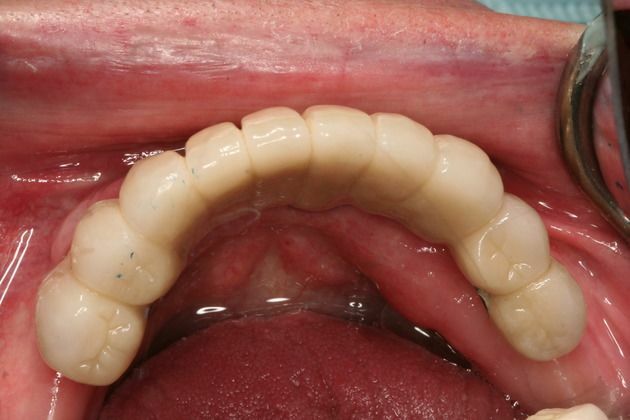 Her treatment consisted of a fixed permanent bridge for her upper arch. This patient was unhappy with existing dental work. She had ill-fitting, decayed bridgework, both fixed and removable. 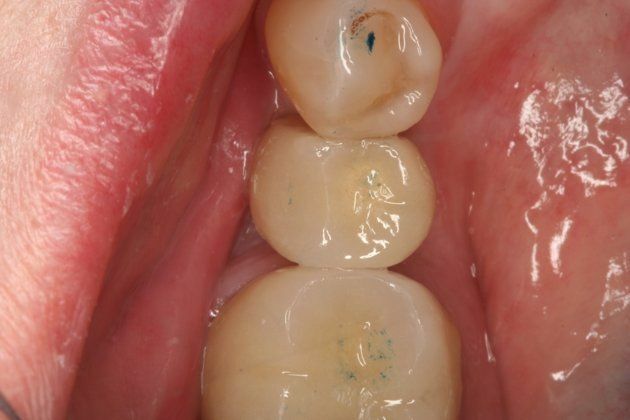 We restored her back to dental health with porcelain fixed restorations. 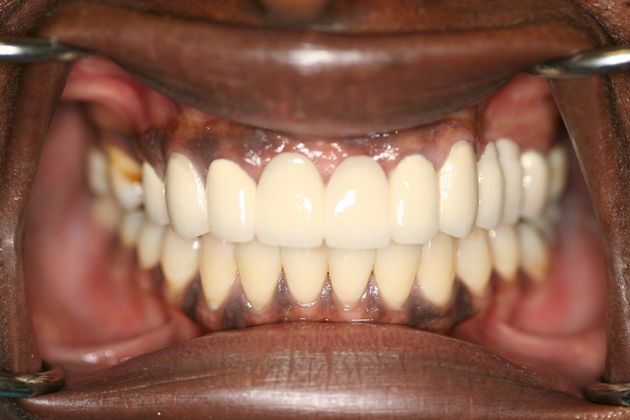 This gentleman had discolored and chipped upper teeth. 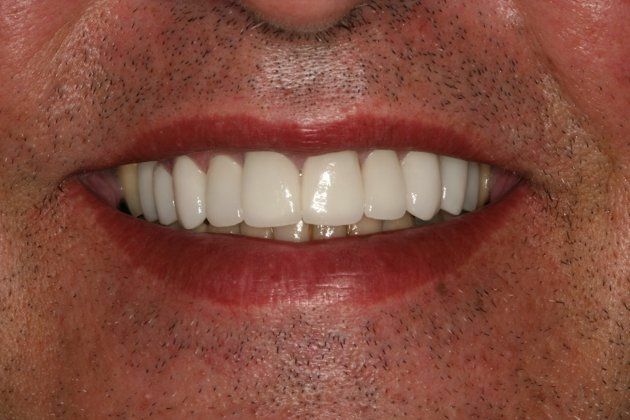 We did a smile makeover with porcelain laminates and crowns, and recontoured his lower teeth, for the perfect smile!! 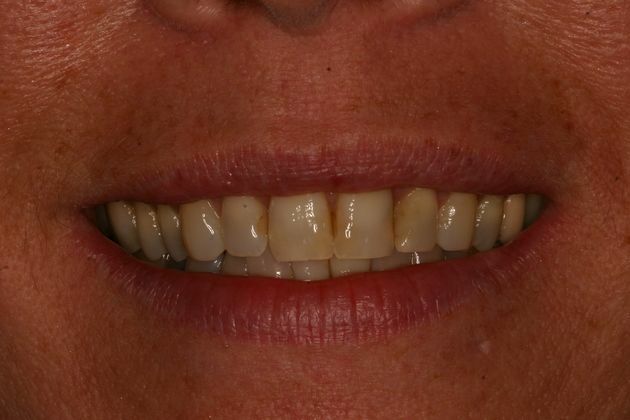 Female patient unhappy with her existing smile, so we replaced discolored old fillings with porcelain crowns for a more youthful-looking, beautiful smile. 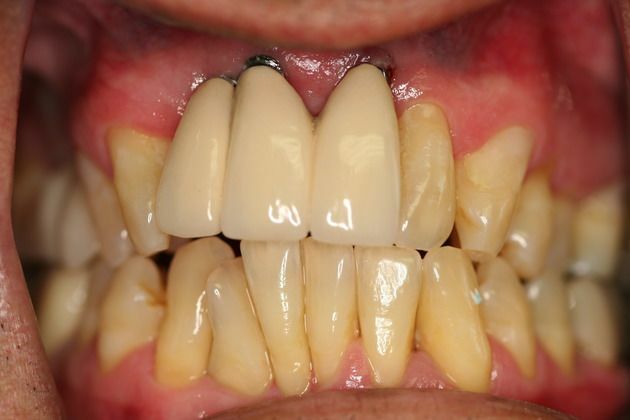 This patient was unhappy with the color and shape of her teeth. 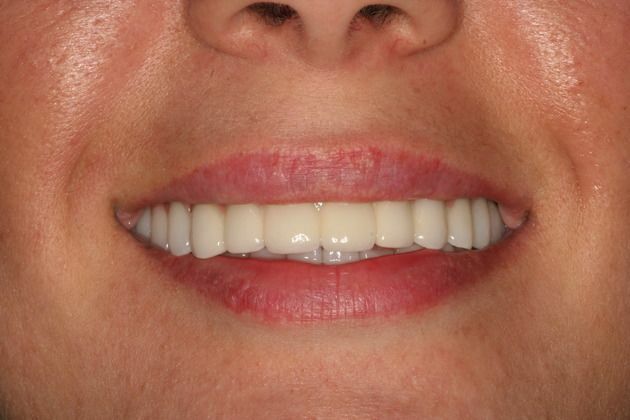 Her smile was rejuvenated with the beautiful result of porcelain veneers! 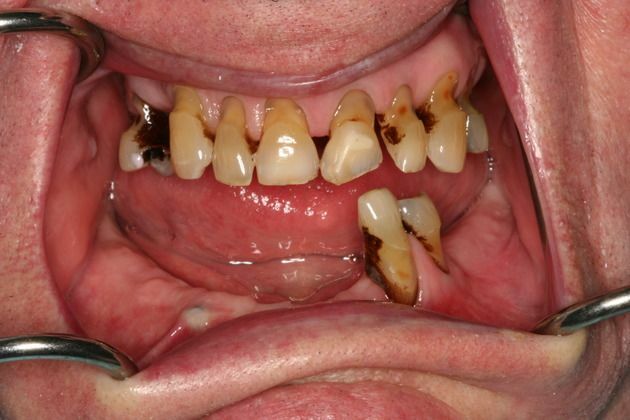 This young man suffered from tetracycline stains on his teeth keeping him from smiling. 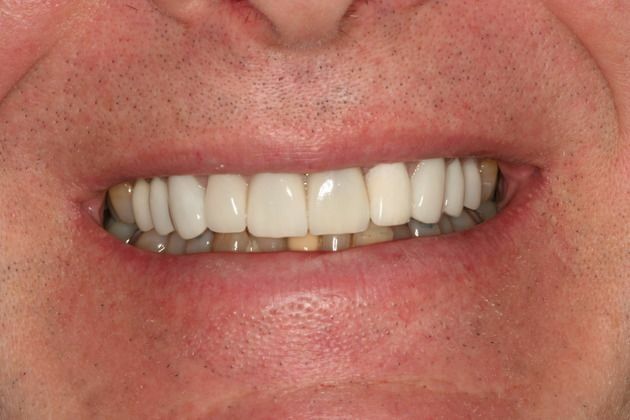 With the use of porcelain veneers and all ceramic crowns, we were able to rehabilitate his smile. 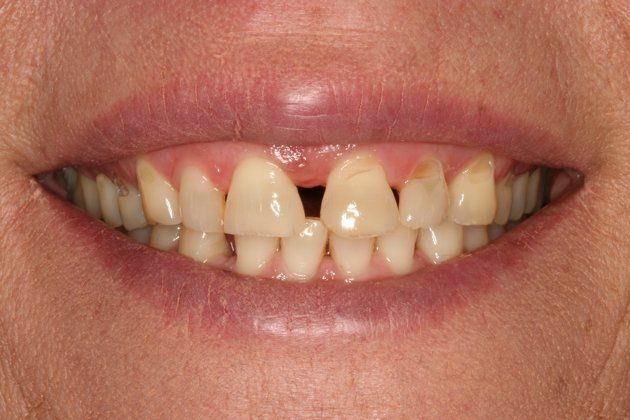 This 67 yr old patient was unhappy with her smile and wanted to close her existing gap. 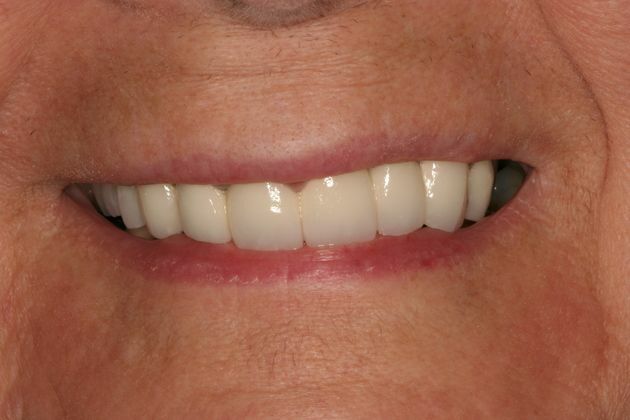 With porcelain veneers and laser reshaping of her gums, we were able to achieve a beautiful more youthful-looking smile. 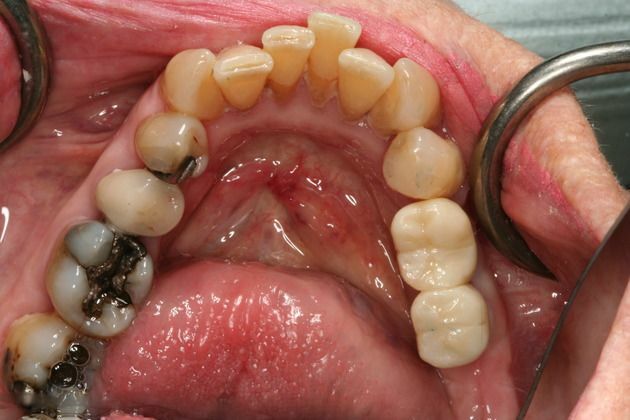 This 69 year old patient had all remaining teeth removed due to periodontal disease. 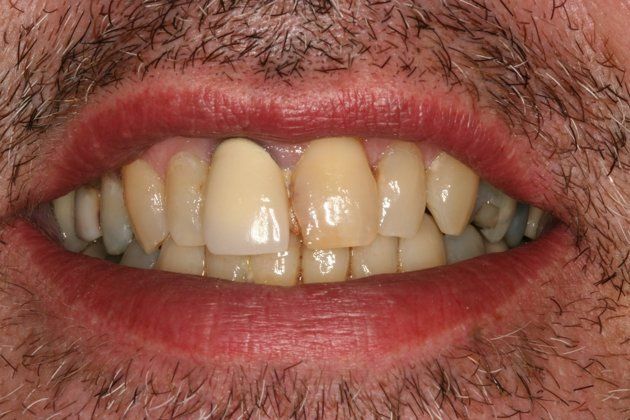 He was wearing a removable denture but wanted something more permanent. 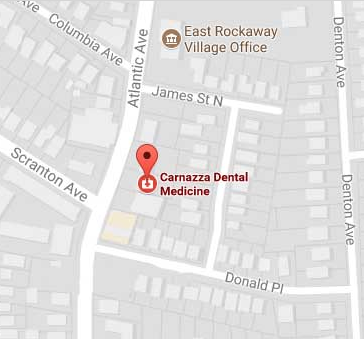 Dr. Carnazza placed four implants and secured an all porcelain bridge to the implants allowing for better eating and smiling. 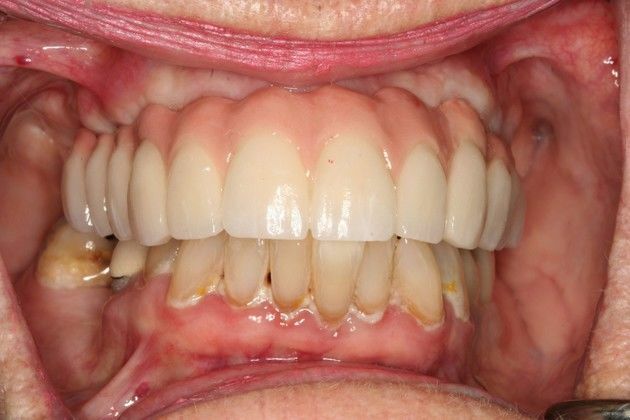 This 30 year old patient lost the majority of her upper teeth form gum disease. 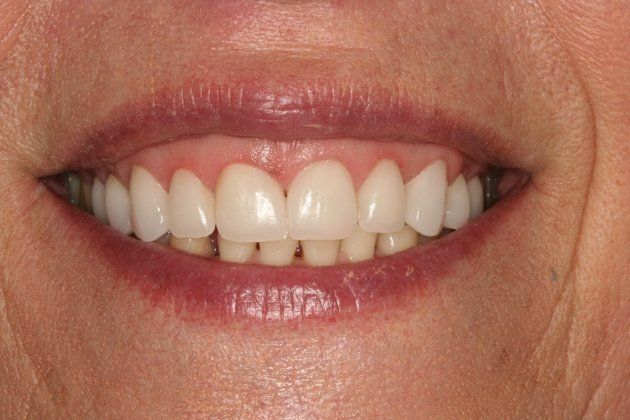 With the use of dental implants and the few remaining natural teeth, Dr. Carnazza was able to restore her smile with fixed ceramic bridgework. Now she can’t stop smiling. 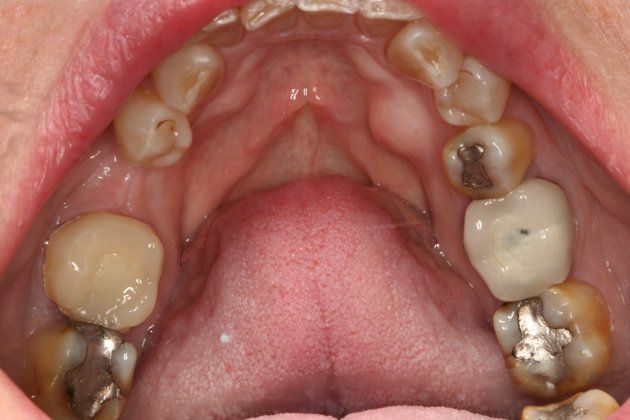 This is a full porcelain to gold bridge replacing both hard and soft tissues. 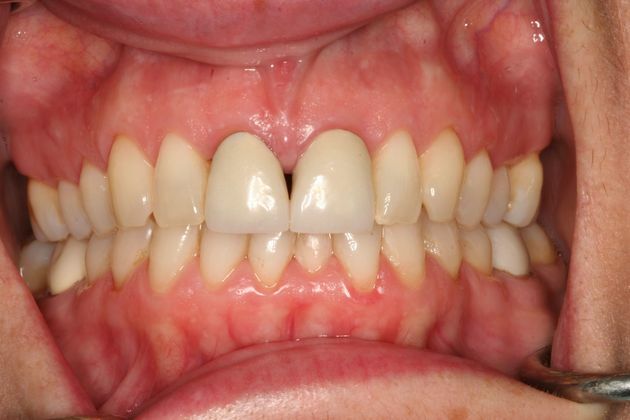 The use of pink porcelain helps prevent teeth from looking unaesthetic. 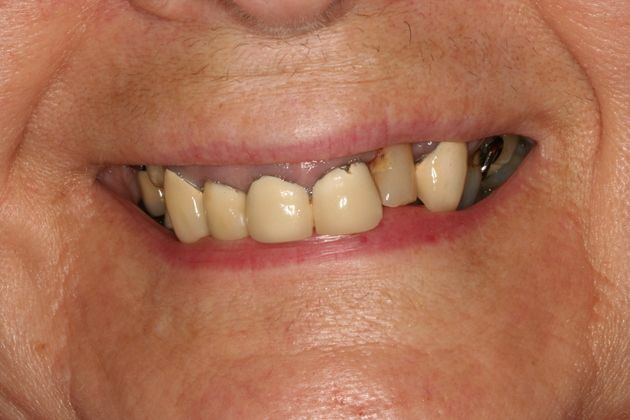 This 81 year old patient is proof dentures are a thing of the past. 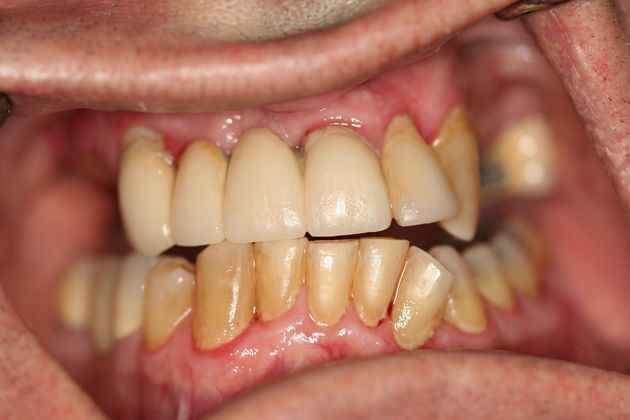 This 67 year old male patient had this poorly designed bridge which didn’t function correctly with his lower teeth. 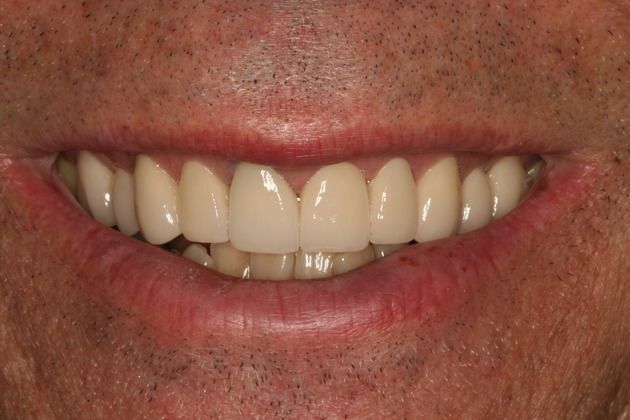 With the use of advanced prosthetic design, Dr. Carnazza was able to restore both function and beauty to his smile. 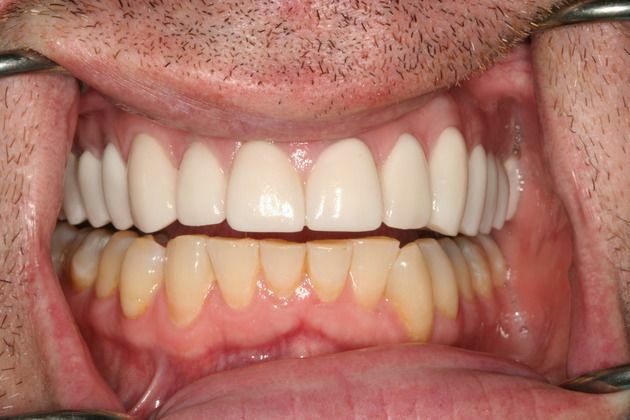 Using the ultra modern Zirlux ceramic system, this bridge is supported on both teeth and dental implants. 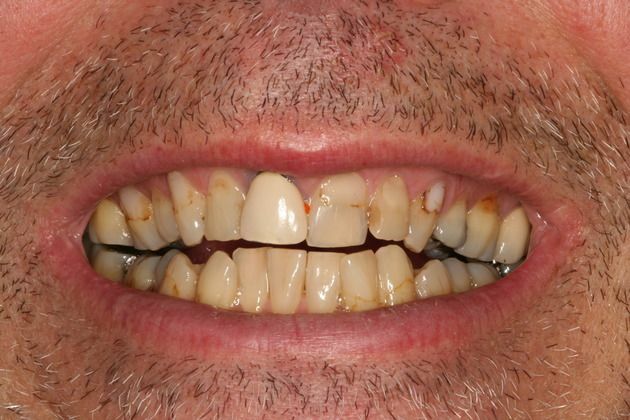 This 47 year old patient was unhappy with the appearance of his smile. He also admitted to grinding his teeth which caused chipping. With modern dental ceramics, we were able to revitalize his smile and now he is mistaken for a famous model. 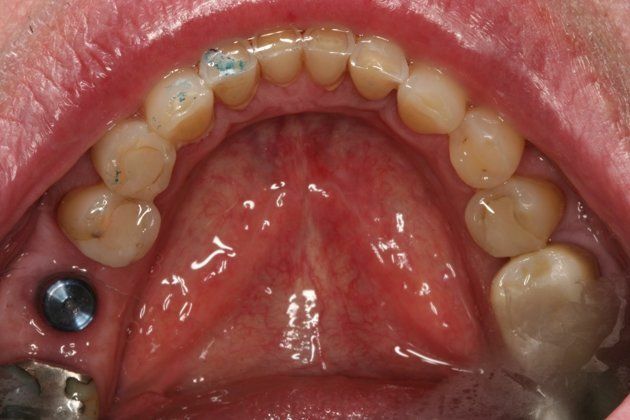 This 80 year old patient lost her teeth due to salivary gland disease. 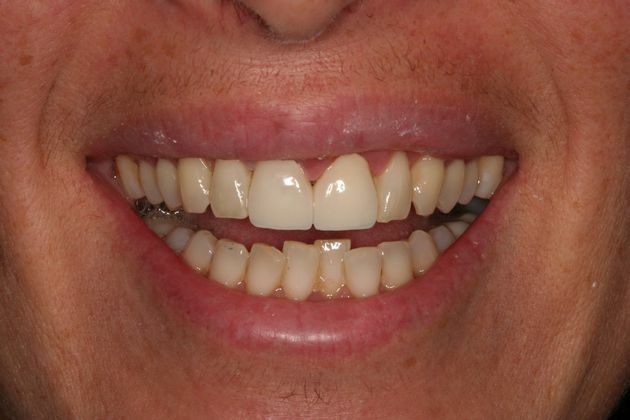 Dr. Carnazza removed her ailing teeth, performed bone grafting, and then placed implants. She now has this quadrant restored so she can chew again. 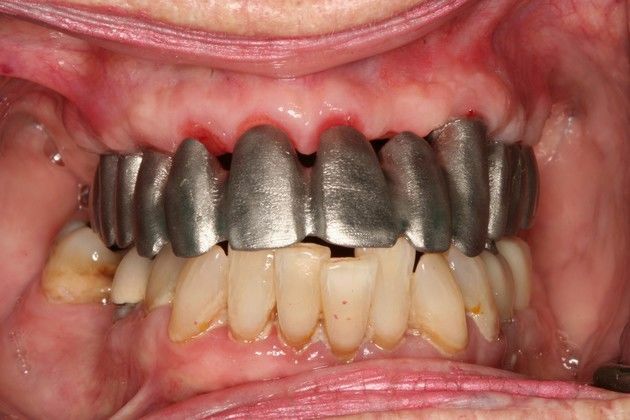 This 67 year old patient presented with long crowns on upper three implants. With the use of pink porcelain, Dr. Carnazza was able to make the teeth look more proportional to the adjacent teeth and gums. 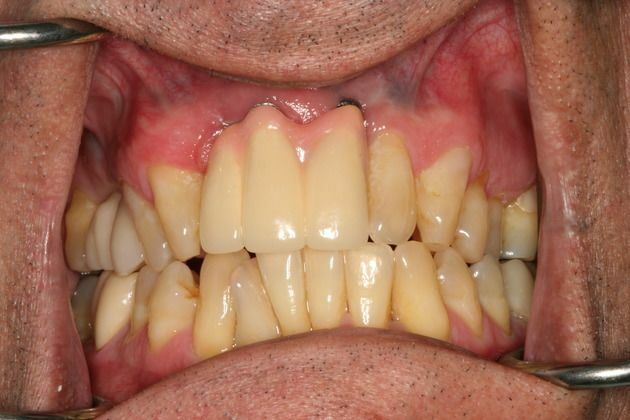 This patient would refrain from smiling because of the old dentistry in his mouth that had deteriorated. 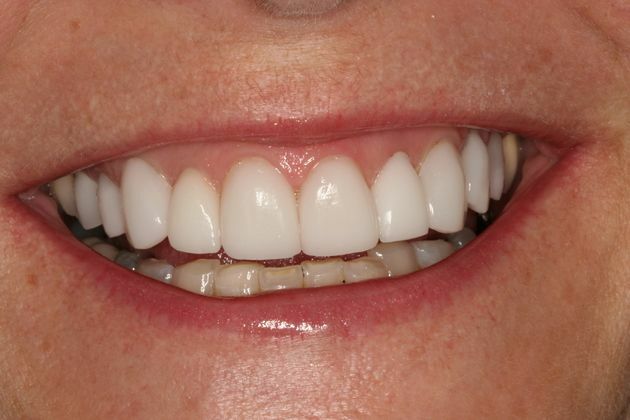 Dr. Carnazza designed a new, healthy smile with porcelain crowns. Now he cannot stop smiling and looks ten years younger. 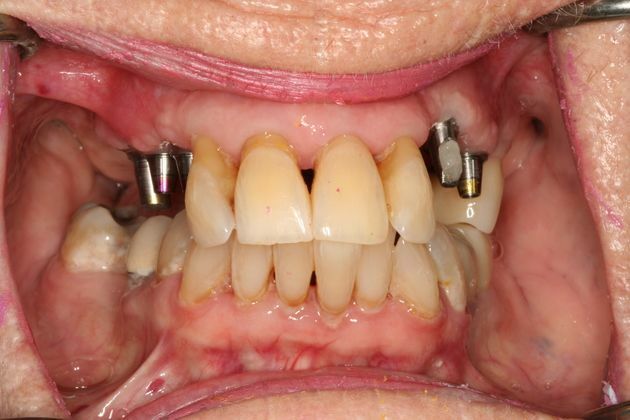 Modern dental ceramics allowed Dr. Carnazza to restore this 81 year old female’s mouth with the aesthetics and function of natural teeth with this cement retained bridge on six implants. The use of pink porcelain and gold substructure creates beauty and longevity superior to traditional dental crowns and bridges. 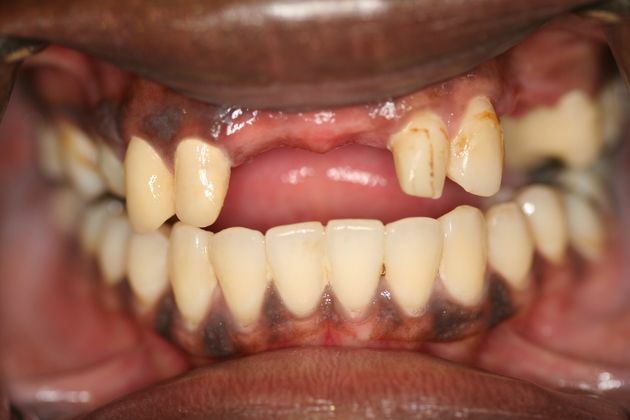 This 50 year old female was in an auto accident in her twenties and suffered trauma to her two front teeth. 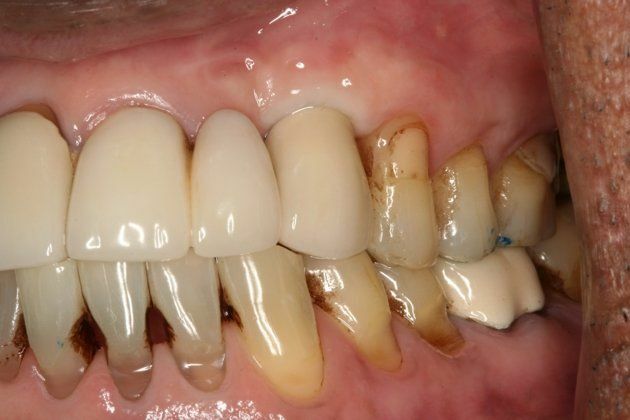 She had traditional porcelain to metal crowns made to restore them. She was unhappy with the appearance and wanted to have a more natural smile. 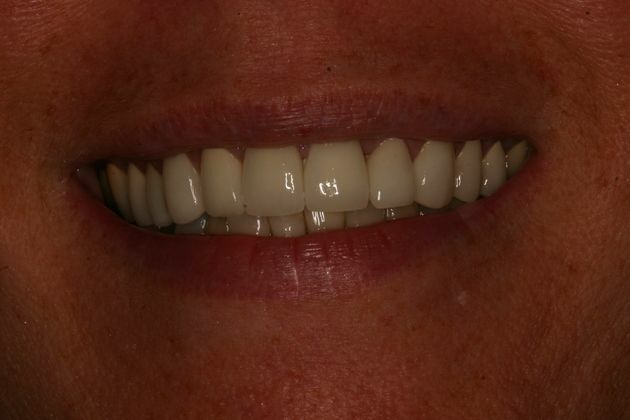 Dr. Carnazza replaced them with all ceramic Zirlux crowns. Excited is an understatement as to how she feels about her new smile.